Press the [MCG] in the lower right corner of the screen to access the Minecraft God menu. You can go to different web sites in the game. For example, you can playing Minecraft Pocket Edition go to our website and download files. Advanced Clock mod for Minecraft Pocket Edition 0.10.5With this mode you will be able control time and travel from one time period to another. Zoom mod for Minecraft PE 0.10.5You have in the top left corner of the screen is a button that serves as an approximation. All clearly shown on screen. Rei’s MiniMap mod for Minecraft PE 0.10.5 / 0.11.1 / 0.11.0 / 0.12.1 Additional features of this mod in your game interface will be a special mini map. Mini map will be small and it will be in the upper left corner of the screen of your smartphone. 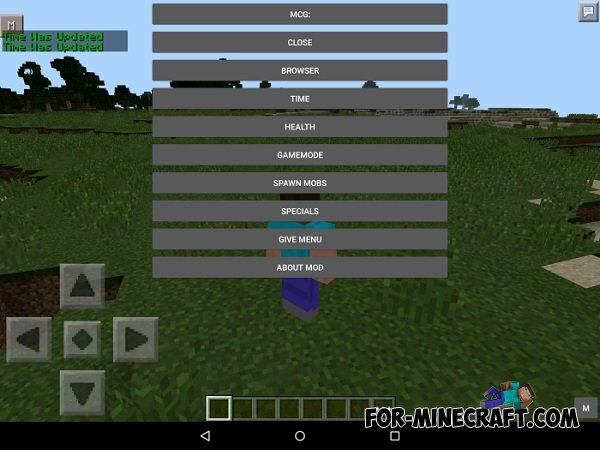 Qickcom script for Minecraft PE 0.10.0This mod for three additional buttons for Minecraft PE. Setting modes in the game there will be three new buttons. With these buttons you can change day to night and vice versa night to day.